Luxurious single story home with 3 bedrooms and 3 baths. This entertaining home has been remodeled inside and outside and includes a party backyard with salt water poo/spa with wading area, conversational fire-pit, built in seating in hardscaped decking around pool along with retractable awnings, sauna, outdoor shower and half bath and custom lighting and speaker system. Covered Bar-B-Q island area includes TV for viewing from many areas of backyard as well as from the kitchen, stainless steel fridges(two), two burners, built-in 42" BAR B-Q with rotisserie and stainless steel sink. 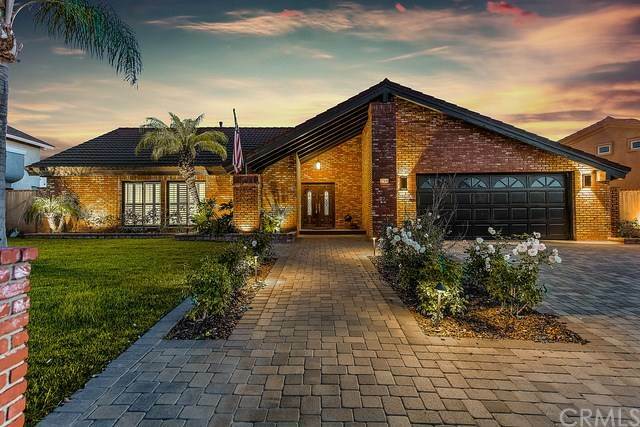 Interior has newer porcelain tile floors along with double pane windows, interior adjustable blinds between double pane windows, ceiling fans, plantation shutters, and Pella folding glass wall doors from living room to pool and decking. Upgraded kitchen with quartz and stainless steel appliances, remodeled bathrooms, crown molding and higher baseboards and ceilings. Side yard includes enough area to park RV (has hook-ups) or use as more entertaining area on lovely hardscape surface. This beautiful home is within walking distance of Villa Park public school and Orange Lutheran HS, and has easy access to freeways and shopping. Lot Size: 0.2 Acres / 8755 Sq. Ft. Directions:From 55 freeway, take Katella exit and go east on Katella, at Wantd turn right and then make a left onto Lincoln; make immediate right onto Fitchen Ranch and then left onto Aberdeen. SchoolsClick map icons below to view information for schools near 17886 Aberdeen Lane Villa Park, CA 92861. Listing provided courtesy of Kathryn Mccarthy, First Team Real Estate.